Valfré’s Rainbow 3D iPhone Case. Image via Instagram. Well, well, well, look who’s possibly getting their ideas from indie brands again! On May 5, the Los Angeles-based indie brand Valfré sent a cease and desist against Forever 21 for allegedly reproducing a phone case, as well as to the fashion retailer Rue 21 (unrelated to Forever 21) for allegedly copying designs created by founder Ilse Valfre. The Valfré team noticed the similar designs when fans of the brand began to send them links to Forever 21 and Rue 21 products, CEO Donald Eley told Jezebel. Valfré’s Rainbow 3D iPhone Case and Forever 21's Rainbow Case look suspiciously alike. Rue 21's headphones, which no longer are available on the site, seem to copy three different designs from the brand. 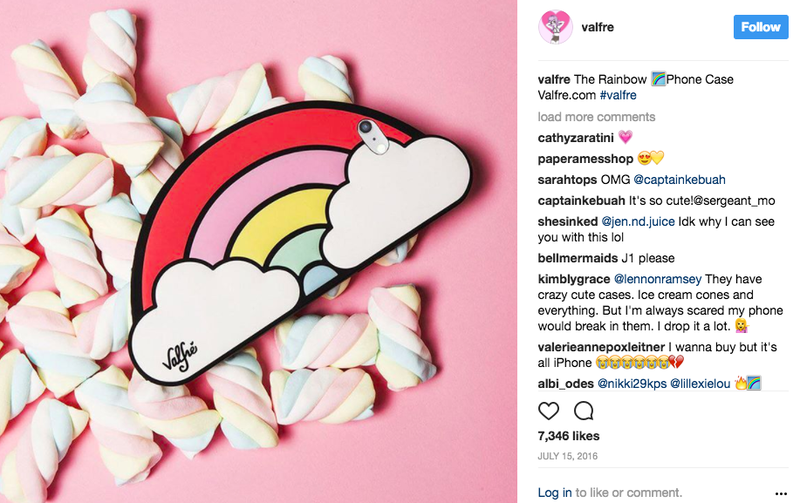 Valfré’s Rainbow Case came out in June of 2016 and Forever 21's version appeared online this March. And the company’s Shell Phone, Boys Tears, and Lipstick cases that were also allegedly copied first came out from Valfré in September 2015; Rue 21's versions were available in September 2016. Forever 21 has a long history of being accused of stealing designs. Just this year alone, the company has been called out for mimicking the designs of indie jewelry brand Sorelle and the activewear company Alala. And in the past they’ve copied everything from Kanye West merch to the Instagram art of independent illustrators. Forever 21 has yet to respond to Valfré’s cease and desist, but a lawsuit for copyright infringement against Rue 21 is moving forward. In documents provided to Jezebel, Valfré asks for “disgorgement of Defendants’ profits directly and indirectly” attributable to Rue 21 using their designs. Rue 21 declined to comment for this story. Jezebel has reached out to Forever 21 and will update if they respond.